Today, the name ‘Airtel’ is synonymous with connectivity in India. This company is one of the largest telecom operators in the country and offers a plethora of services including internet connectivity (broadband). While consumers who are constantly on-the-go prefer to use internet on their phones, those who want a stable connection for surfing the net or streaming videos still choose to use broadband. In India, broadband connectivity has come a long way since the internet boom. The advent of broadband meant that an average internet user in the country no longer needed to head out to the nearest internet cafe to enjoy high-speed connectivity. They could get this benefit from the comfort of their own homes. With broadband, the internet finally became a viable tool that could be used in a manner beyond basic browsing and email. Thanks to Internet Service Providers (ISPs) such as Airtel, the average Indian could leverage the full potential of the internet. As the years went by, the internet needs of the average Indian increased. The rise of online video streaming and gaming demanded a faster internet connection speed. Airtel recognized this change in the consumers’ needs and tweaked its plans to meet them. From increasing its minimum speed to increasing the data cap, Airtel has been providing plans that cater to the needs of the average Indian. Airtel’s high-speed broadband services are amongst the best in the country thanks to the high connectivity speeds it offers. Unlike most ISPs in India, Airtel offers speeds of up to 100Mbps, which is more than enough to stream 4K videos online. And if that isn’t enough, Airtel also offers a bunch of features along with its high-speed plans. Not only do subscribers get a Wi-Fi router for free, but they also get 1000GB data as a bonus for joining the Airtel family. Additionally, if there is any data that is left over after the month ends, the remainder is carry-forwarded to the next month. How cool is that! Subscribers also get to enjoy unlimited calling, so they can talk to their loved ones without racking up a huge bill. As a special bonus to its broadband subscribers, Airtel is offering a free subscription to Amazon’s Prime subscription service. Prime membership gives users access to many benefits such as free faster delivery options and exclusive offers. They also get access to Amazon Prime Video and Amazon Prime Music. However, it should be noted that this offer is only valid for those who opt for the Rs. 1,099 and Rs. 1,299 plans. It doesn’t end here. Airtel is constantly working on improving its services, like rolling out V-fiber optics across the country. V-fiber optics offer even better stability and faster speeds, meaning Airtel subscribers will be able enjoy non-stop entertainment. Further, V-fiber optics allow up to 10 devices to connect to the router at any given moment. This feature is a must as the rise of IoT (Internet of Things) means that more devices need a constant internet connection to work properly. This feature will be available across the nation very soon. With so many names competing for the top slot in broadband services, Airtel has been ensuring that its plans and benefits make the consumers sit up and take notice. 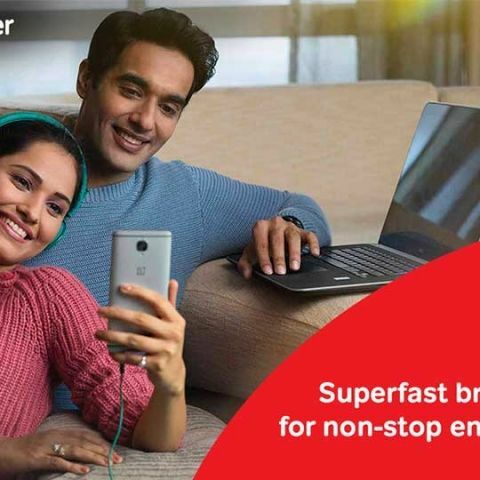 Airtel’s broadband service not only offers a high-speed connectivity but also a number of additional benefits. All this makes it an interesting proposition for anyone who is looking for a speedy yet stable broadband connection.